If eating meat is a crime, then vegetarians have a high rate of recidivism. According to a new study by the Humane Research Council, 84 percent of American vegetarians eventually return to eating meat, a third within three months. Five out of six “find their way back to a nice juicy steak,” reports the New York Daily News. No surprise here. Steak is the emblem of carnivores everywhere. And I do mean everywhere. 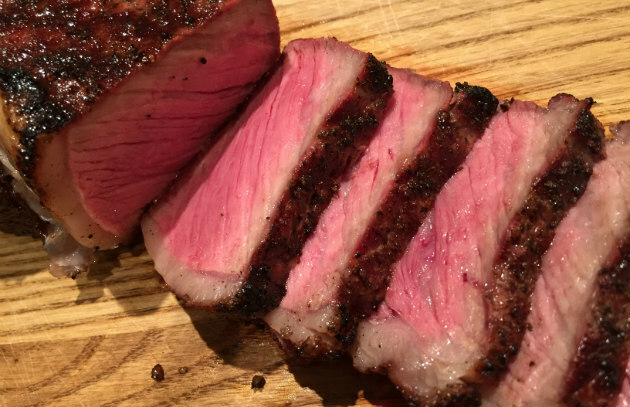 Below are 12 of the best grilled steaks you’ll find across Planet Barbecue (with links to recipes). 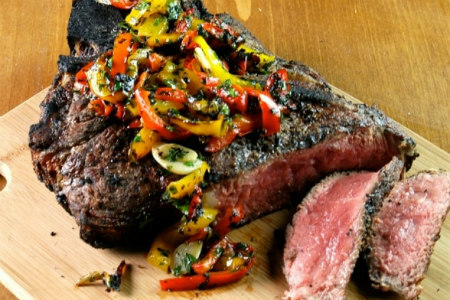 This is it—the primal steak—the ultimate flavor junkie’s T-bone. You grill it not on the grate, but directly on the embers. This produces a crusty surface char and a smoke flavor you can’t replicate on a conventional grill grate. Add a scorching pan sauce of jalapeños, cilantro, and garlic, and you’ve got T-bones with off-the-chart wow power. Tuscans like their steaks rare, and this bible-thick Porterhouse spends just enough time over a charcoal or wood fire—often in the fireplace—to sear the exterior dark and crusty while leaving the center still mooing. In a perfect world, you’d start with dry-aged Chianina, a massive breed of white cattle native to Tuscany, seasoned profligately with coarse salt and pepper, and drizzled with green Tuscan extra virgin olive oil. The meat juices and oil form the sauce. Lemon wedges optional. Casa Julián occupies a funky former garage in Tolosa, Spain, an hour or so drive from San Sebastian. This chuleta—3-finger-thick, salt-crusted, charcoal-grilled, bone-in rib steak—will make you want to repeat the journey the next day. 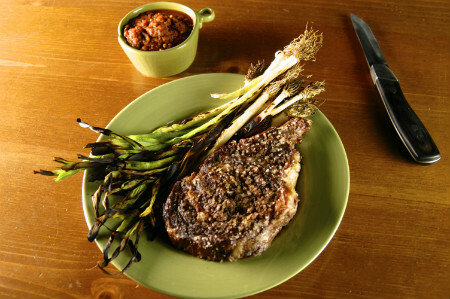 At home, I accompany it with Spain’s smoky grilled vegetable and nut sauce, romesco. I have long wondered how Argentina, a nation of relentless carnivores, manages to stay so trim. (Average per capita beef consumption tops 120 pounds per year.) This “Heart-Stopper” has it all: butterflied grilled strip steak piled high with bacon, fried eggs, and garlicky chimichurri. Consider popping an extra Lipitor before partaking. Carne asado (literally, “grilled meat”) is Mexico’s national steak—wafer-thin slices of sirloin or top round seasoned simply and grilled over charcoal. 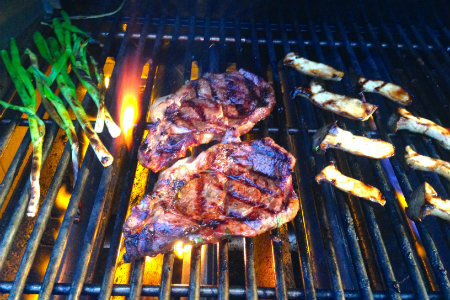 (The fireworks come from grilled chiles and green onions.) You’ll find it wherever crowds gather and an enterprising cook has space to set up a grill, like at the Mercado 20 de Noviembre in Oaxaca. Enjoy it tucked into grilled tortillas with salsa and guacamole. No steak knife required. Named for the Malay word for grandmother, nonya refers to a style of cooking that combines Chinese ingredients, like soy sauce and oyster sauce, with traditional Malay flavorings, like chiles, turmeric, and coconut milk. You can make it with rib eye, New York strip, skirt steak, or flank steak. Adjust the cooking times depending on the thickness of the steak, and always slice on a sharp diagonal into thin slices. Like all steaks cut from a steer’s undercarriage, the hanger (onglet in French) packs oversized flavor. (It “hangs” from the steer’s diaphragm, hence the name.) I discovered it during my student days in Paris, where it’s traditionally served with a sharp tangy red wine shallot sauce. Philadelphia has an unlikely rival for cheesesteak supremacy in the Croatian city of Split. I say “unlikely” because Split, on the stunning Dalmatian Coast, is best known for its seafood. You start with thin sliced sirloin and pound it even thinner with a mallet, prior to folding and stuffing with smoked ham, sliced mushrooms, and cheese. Think steak sandwich without the bread. Named for the Korean words for “fire” and “meat,” bool kogi starts with thin slices of rib-eye, which are steeped in a sweet-salty sesame soy marinade before being charcoal grilled on a brazier at your table. Eat it wrapped in lettuce leaves with grilled garlic and chiles and other Korean condiments. Think of saté as steak on a skewer—a popular street food throughout Southeast Asia. So it’s no small accomplishment to have your saté named the “best” in Singapore by The Straits Times—an honor bestowed on my stepson, chef Jake Klein, when he ran a wood-fired restaurant here. Cumin, coriander, and garlic provide the base flavor, while cucumber relish and spicy peanut sauce take it over the top. In the U.S.A., beef and bourbon have been keeping company for centuries. There’s something about the smoky tang of bourbon that enhances the rich meaty taste of grilled flank steak. (You can also use top or bottom round.) The five-ingredient marinade is mercifully simple; the complex flavor is not. Nothing says magnanimity at a barbecue like a whole beef tenderloin. In the spirit of the best Brazilian steakhouses, you’ll season the meat simply, then spit-roast it to sanguine awesomeness. Let rest, then carve crosswise into slices and serve with a fresh tomato-onion salsa. No rotisserie? No problem. Instead, set up your grill for indirect grilling. Your target temperature: 135 degrees for medium-rare.